The OHM BOCES Distance Learning service is a cornerstone for the future development of expanded educational opportunities in this region. The service creates a fiber-optic telecommunication network with the capacity to link all our component school districts, the BOCES complex and area colleges. Linkages with regional networks, other states, and even other countries enhance educational opportunities and promote a new sense of sharing and teamwork among both students and teachers in the region. 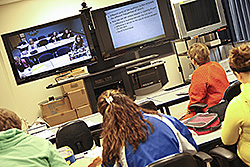 The OHM BOCES Distance Learning service provides opportunities for interactive video, web-based instruction, blended and online learning. The online learning platforms can also be used to enhance traditional and video distance learning classes and provides support for Common Core modules. See Web Instructional Services for more detail.